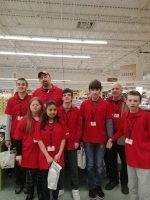 Acme supermarket in Mahopac hosted a class trip for students in Ms. Lavery’s Mahopac Middle School class. The students toured the store and learned the importance of recycling and how to exchange their coins for paper money. They visited the produce department and were given the opportunity to taste different fruits and vegetables. They learned about lobsters and decorating cupcakes. Each student was given a $5 Acme gift card and the opportunity to shop for themselves and learn how to budget money.